PALA INDIAN RESERVATION (4-7-2019) – For the parents to recall, in order for the San Diego Padres to win the 1996 National League West Division title, everyone said that every player needed to contribute and make a significant difference, even just once — and everyone had, except one. Finally, in the 162nd and final game of the regular season, the Padres went into extra innings in a scoreless ballgame at Los Angeles. And that one player, Chris Gwynn, brother of future Hall of Fame right fielder Tony Gwynn, had done nothing all season — he publically admitted as much on several occasions. So when the younger brother was called on to pinch-hit in the 11th inning, it was his last chance to deliver or the Padres may have missed the playoffs. Chris Gwynn drilled the ball to the outfield wall at Dodger Stadium, good for a 2-run double. Hunched over at second base, he meekly looked toward his dugout at his celebrating teammates, giving a small fist-pump in acknowledgment. Everyone had now contributed; the Padres were division champions, doing so by defeating their regional rivals. Now, turn to Saturday’s (Apr. 6) Silver Division of the Jaguar Classic softball tournament. El Capitan found a player from deep on the bench to register the game-winning, walk-off run — better, call it a “sprint-off” winner. 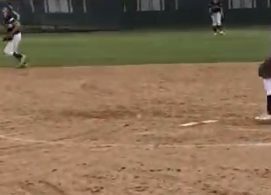 Ali Gay, a senior who’s gone hitless all season, was able to contribute with her legs, scoring on a wild pitch to lift the Vaqueros into the championship of the Jaguar Classic by nipping Del Norte, 6-5, in the semifinals. Gay moved to second base on a sacrifice bunt by center fielder Brandy Taylor, then Gay showed off her speed by advancing to third base on a fly ball out to right field by Brooke Horn. With two out, Hannah Davis came to the plate, already the owner of an RBI single. So Del Norte tried to pitch around her. But on a 1-0 offering, the pitch went to the backstop, allowing Gay to race off with the winning run. 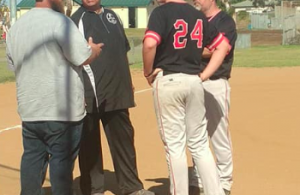 Both teams were aware of the tournament time limit and the 5th would be the final inning, or they would go to an International Tiebreaker in the 6th. Gay’s run made a winner of Vaqueros relief pitcher Horn, who allowed just one run on three hits in her three innings of work. For El Capitan (14-5), seven different players registered hits, but only Martinez had two. Del Norte fell to 10-6 overall. EL CAPITAN 14, SAN PASQUAL 4: In the Silver Division championship of the Jaguar Classic, with No. 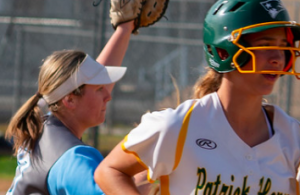 1 pitcher Alexa Williams running on fumes, Brooke Horn stepped into the circle to overwhelm the Golden Eagles to lift the Vaqueros to the championship. With Williams being saved for Wednesday’s battle with Helix to unlock the schools’ first-place deadlock in the Grossmont Valley League, Horn rolled to the win on a 7-hitter. Except for San Pasqual standout Annie Villalobos (3-for-3), the remainder of the Golden Eagles did little to dent Horn. Meanwhile, the Vaqueros scored six times in the 2nd inning for a 7-1 lead, then doubled their score with seven additional markers in the 4th to invoke the run rule. Bailey Olaveson provided most of the early offense. After the Vaqs first baseman singled and scored in the 1st, she started the scoring in the 2nd with a bases-loaded, two-out double for a 3-0 lead. And when Williams and Allyson VonYokes followed with doubles and the rout was on. El Cap’s top five batters combined for 11 hits. Leadoff batter Madison Rosales went 2-for-3 with two runs, followed by Brooklyn Fukashima (2-run single), Olaveson (3-for-4, 2 RBI, 2 runs), Williams (2-for-3, 3 RBI), and VonYokes (2-for-4, 2 runs). San Pasqual (14-8) had its 5-game win streak snapped.